Complete your bathroom renovation project with a stylish basin faucet. 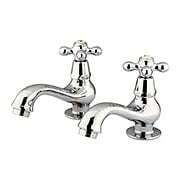 These unique faucets feature two separate spouts, one each for hot and cold water. Make sure your sink is pre-drilled with 2 holes before ordering. When restoring your vintage sink, only the most authentic accents will do. 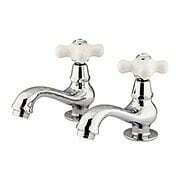 Our Royal River basin tap fits the bill with its traditional spout and porcelain cross handle. Constructed of solid brass, it comes in your choice of four tarnish and corrosion-resistant finishes and features a drip-free ceramic cartridge system. This set offers modern convenience in a classic package. When restoring your vintage sink, only the most authentic accents will do. 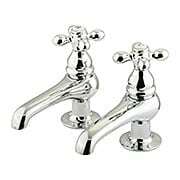 Our Royal River basin tap fits the bill with its traditional spout and cross handle. Constructed of solid brass, it comes in your choice of three tarnish and corrosion-resistant finishes and features a drip-free ceramic cartridge system. This set offers modern convenience in a classic package. When restoring your vintage sink, only the most authentic accents will do. Our Stony Brook basin tap fits the bill with its traditional teapot spout and metal cross handle. 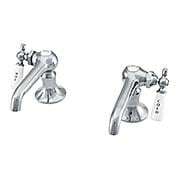 Constructed of solid brass, it comes in a polished chrome, tarnish and corrosion-resitant finishes and features a drip-free ceramic cartridge system. This set offers modern convenience in a classic package. When restoring your vintage sink, only the most authentic accents will do. Our Stony Brook basin tap fits the bill with its traditional teapot spout and porcelain cross handle. Constructed of solid brass, it comes in a polished chrome, tarnish and corrosion-resistant finish and features a drip-free ceramic cartridge system. This set offers modern convenience in a classic package. When restoring your vintage sink, only the most authentic accents will do. Our Stony Brook basin tap fits the bill with its traditional teapot spout and white porcelain levers. Constructed of solid brass, it comes in a polished chrome, tarnish and corrosion-resistant finish and features a drip-free ceramic cartridge system. This set offers modern convenience in a classic package. When restoring your vintage sink, only the most authentic accents will do. 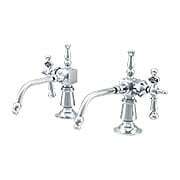 Our Stony Brook basin tap fits the bill with its traditional teapot spout and American levers. Constructed of solid brass, it comes in a polished chrome, tarnish and corrosion-resistant finish and features a drip-free ceramic cartridge system. This set offers modern convenience in a classic package. When restoring your vintage sink, only the most authentic accents will do. 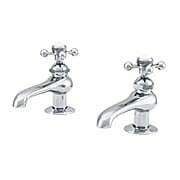 Our Royal River basin tap fits the bill with its traditional spout and lever. Constructed of solid brass, it comes in your choice of three tarnish and corrosion-resistant finishes and features a drip-free ceramic cartridge system. This set offers modern convenience in a classic package. When restoring your vintage sink, only the most authentic accents will do. 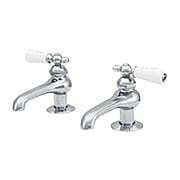 Our Royal River basin tap fits the bill with its traditional spout and porcelain lever. Constructed of solid brass, it comes in your choice of three tarnish and corrosion-resistant finishes and features a drip-free ceramic cartridge system. This set offers modern convenience in a classic package. 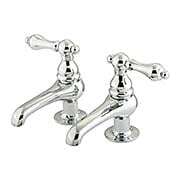 Bring Victorian flavor to your vintage sink with the Welland basin tap. Constructed of solid brass, it comes in your choice of two tarnish and corrosion-resistant finishes and features a drip-free ceramic cartridge system. 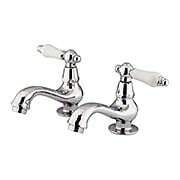 Its sleek spout and decorative lever offers modern convenience in a classic package. Comes complete with chain and stopper. Bring Victorian flavor to your vintage sink with the Winster basin tap. Constructed of solid brass, it comes in your choice of two tarnish and corrosion-resistant finishes and features a drip-free ceramic cartridge system. Its sleek spout and porcelain lever offers modern convenience in a classic package. When restoring your vintage sink, only the most authentic accents will do. 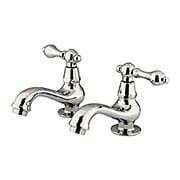 Our Tahoe basin tap fits the bill with its traditional spout and American cross handle. Constructed of solid brass, it comes in your choice of five tarnish and corrosion-resistant finishes and features a drip-free ceramic cartridge system. This set offers modern convenience in a classic package. When restoring your vintage sink, only the most authentic accents will do. Our Tahoe basin tap fits the bill with its traditional spout and porcelain American cross handle. Constructed of solid brass, it comes in your choice of five tarnish and corrosion-resistant finishes and features a drip-free ceramic cartridge system. This set offers modern convenience in a classic package. When restoring your vintage sink, only the most authentic accents will do. 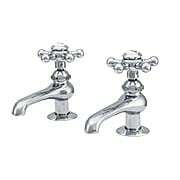 Our Tahoe basin tap fits the bill with its traditional spout and cross handle. Constructed of solid brass, it comes in your choice of five tarnish and corrosion-resistant finishes and features a drip-free ceramic cartridge system. This set offers modern convenience in a classic package. When restoring your vintage sink, only the most authentic accents will do. 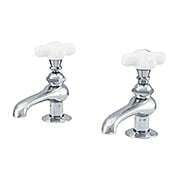 Our Tahoe basin tap fits the bill with its traditional spout and porcelain lever. Constructed of solid brass, it comes in your choice of five tarnish and corrosion-resistant finishes and features a drip-free ceramic cartridge system. This set offers modern convenience in a classic package.